2016 Sunseeker 2500TS, 3 slides, 2 slides work fine, awning is fine, Wardrob slide fails after moving out 3 inches by turning sideways, left motor driving, right motor stops as if stuck on something. The bad side WILL retract fine so the motor has power at least in one direction so I need to find the slide controller. Can anyone help by describing WHERE the slide controllerS are located??? I have read many postings on the subject and have not been able to locate the controllers. Not in the closet, not under the bed, not by the water pump, not by the tanks and not under the dinnette. Are they visible from the living area or is it necessary to remove panels ? The controllers for the bed and wardrobe are under the bottom section of the bed in the very similiar 2800. The bed slide needs to be out to make access easier. You might need a prop rod to hold the bottom section up. When you find it, you should be able to read the fault lights. Odds are your problem is the hall effect sensor. Lots of help available to fix that without replacing the motor. We have friends with a rig that has the controller in a compartment you can't get to if the slide is stuck in the "in" position. Thats a better place for them IMO. I had a similar problem and the slide had to be reset. You should be able to find directions on how to do so. We have a different model, but it's worth looking in similar locations. You have 3 slides, I have one. 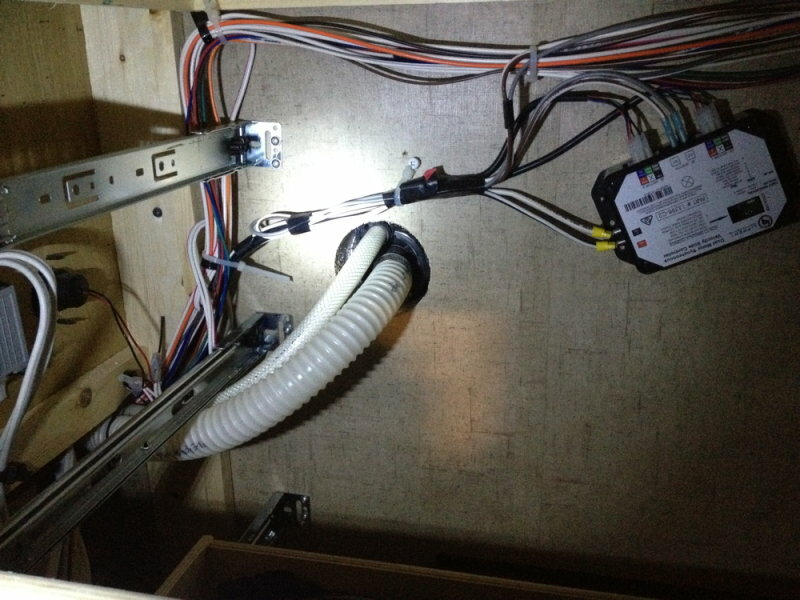 I reworked all the wiring in this area as it was haphazardly routed. Additionally, the wiring to the motor on the aft end of the slide was not well routed as may have become abraded by the mechanisms had I not taken action. I rerouted it a bit, and added a small cable loop to keep it out of harm's way. Good luck, and let us know where you find the controller for your errant slide. No doubt, as you have 3 slides, you'll have 3 controllers.